Its a fairly common ride, but I do love that swimmy feeling in my stomach that I get when riding this one. A great view fom up there. I really enjoyed this ride. The launch up was pretty good. Better than Dr. Dooms at IOA. Great air time at the top of the tower. But the drop side was a lot more fun I thought. The anticipation is great going up the tower and what a view of the park... The line usually isnt too long either. This is a definite ride at Cedar Point! Space Shot - Much better than Maliboomer at Disneys California Adventure. Turbo Drop - Supreme Scream at Knotts Berry Farm is much better. The Space Shot side is amazing. You get thrown into the harness when you hit the top and just float. 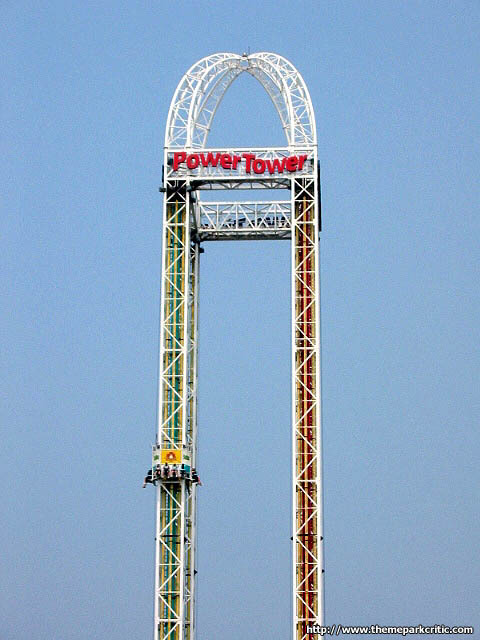 I love Power Tower, but Im partial to the Turbo Drop. While its fun waiting to shoot up on the Space Shot as everyone watches, I get a bigger thrill out of slowly making my way up and anticipating the drop once we stop. Even though it generally takes the same amount of time to drop, its always fun wondering exactly when it will happen and its always a surprise. 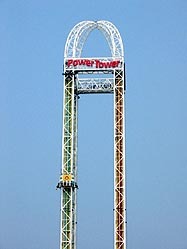 Power Tower is great because of its suspense, and the great view of the park and Lake Erie it allows. This ride was WAY TOO SMALL! I guess you could say that Ive been spoiled by Drop Zone, but hey, getting shot up was really fun and a nice change of things. Lets just put it this way, Ive seen better, but still a good ride. I like to call this ride the heart-attack machine LOL, cause if you want a good scare, go on it! I was only on the one that shoots you down...line was a bit long. But nonetheless, its a great ride. Definitly not reccomended if youre scared of heights! 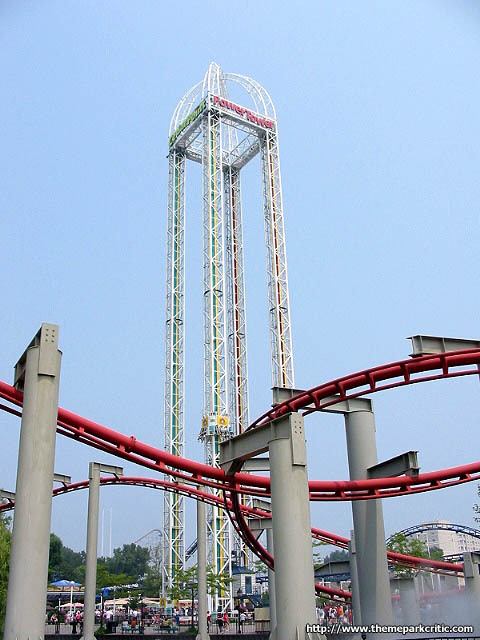 Power Tower is one of the best S&S towers around, and one of the best drop rides anywhere. This is better than most Freefalls, especially Intamins, because your up on this ride for a very long time! The turbo drop is fun and a little frightening while your on the bottom and the sound turns on before you blast.